Hi everyone! Just thought you would like to see my lastest build I've been working on. I basically started with a standard 1991 Sportster & tore the thing to pieces. I fabricated the new frame from some 1 1/4" dom tubing. Hope you all like it! I'm sure this bike's a head turner. Good looking frame. I like that you made it with the smaller diameter tubing like the original chops back in the 60's and 70's. And that the backbone is a straight line between the rear axle and neck. I never cared for the way most modern chopper frames and gas tanks dip down in front. Good job on this one! 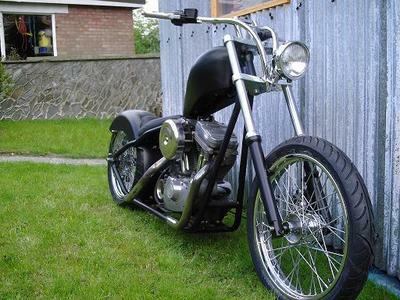 I love the sportster bobbers but how do you get insurance for these things, especially when you fabricate a frame? Don't you need a VIN to get insurance and I thought the VIN on the frame and the VIN on the engine had to at least be from the same year and preferably the same make and model? Your bike looks way cool. Sportys look good stock and even better when they are stripped down like yours. I like the colour...black. I hope my Virago looks as good when it's done.